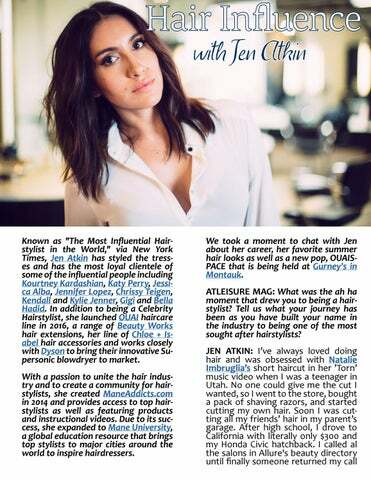 Known as "The Most Influential Hairstylist in the World," via New York Times, Jen Atkin has styled the tresses and has the most loyal clientele of some of the influential people including Kourtney Kardashian, Katy Perry, Jessica Alba, Jennifer Lopez, Chrissy Teigen, Kendall and Kylie Jenner, Gigi and Bella Hadid. In addition to being a Celebrity Hairstylist, she launched OUAI haircare line in 2016, a range of Beauty Works hair extensions, her line of Chloe + Isabel hair accessories and works closely with Dyson to bring their innovative Supersonic blowdryer to market. With a passion to unite the hair industry and to create a community for hairstylists, she created ManeAddicts.com in 2014 and provides access to top hairstylists as well as featuring products and instructional videos. Due to its success, she expanded to Mane University, a global education resource that brings top stylists to major cities around the world to inspire hairdressers.